Easingtn Sports missed out on a place in the final of the UHL Bluefin Sports Supplementary Cup on Tuesday. They lost 4-2 on penalties against Thornbury Town at Addison Road, where 90 minutes and extra-time failed to find a winner. The game ended 1-1 after Thornbury broke the deadlock in the first half against the run of play. Sports started well and Andrew Stidder volleyed over following a neat move. But Thornbury broke the deadlock when a quick counter-attack ended with Harry Brock beating the advancing Adam Rimmer. 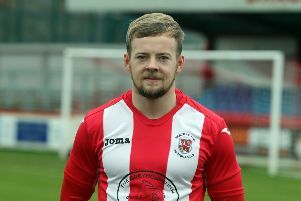 Sports equalised after the restart when Tom Smith advanced and released Stidder who curled his effort inside the far post. Sports had the better chances, the final ball was missing but they went closest in extra-time when Michael Spaull volleyed over. In the penalty shoot-out, Kurtis Parkin superbly saved Callum Convey’s first spot-kick. Thornbury netted their first four penalties with Stidder and Charlie Hill scoring for Sports but George Coombes hit the bar and that was that.